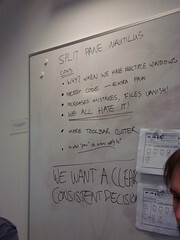 One of the wishlist items that came up is if there was a way we could set marker points within our large and long usability test video files, in order to be able to document and skip to points of interest within the file quickly, and also so that we would be able to export small and short clips of video to be able to share widely. You see, not only is it timely to view an entire usability test video – they are very large and unwieldy, and expensive to host which makes it tougher for us to share the great data we’re gathering. For example, the markers I’d love to set up in a usability test video file would be to indicate where test task 1 started, where test task 2 started, so on and so forth. I’ve been talking with super-hacker Bastien Nocera about how marker-setting might possibly be achieved in a totem plug-in. For him, it may kill two birds with one stone as newer video file formats have a notion of chapters within the file and totem does not currently display them. There’s more ideas I’d like to mock up here (including a full-screen variation of the mockup) but I’m leaving for the day so I wanted to make sure I shared what I got for now. 🙂 Also, the markers on the timeline are not going to be possible – although I would love a way to have the ticks highlight to show the markers selected on the right on the timeline itself – but there is no ‘active’ or ‘highlighted’ mode for the tick widget if I understand correctly. Anyway! I would love to hear your ideas. Thanks for the thorough reporting from the UX hackfest. It is much appreciated from those who aren’t there. One related feature I’ve always wished for is for totem to have a back-forward navigation history like Nautilus (or any browser really). This is needed because totem does not allow multiple instances. If I’ve found a part in one video I want to compare with a second video, opening the second one will replace the first video in totem. Not only have I now lost the position in the first video, if I can remember the time position, I still have to go to the file menu, select the next recently used document and seek back to that position. If I want to quickly switch between two freeze frames (whether they are in the same video or not) this is impossible. I find myself looking for the back button anyway, probably because browser interaction dominates our lives now. Wow, killer-app in sight ! Excellent idea ! Great post, I really hope this turns into actual code. 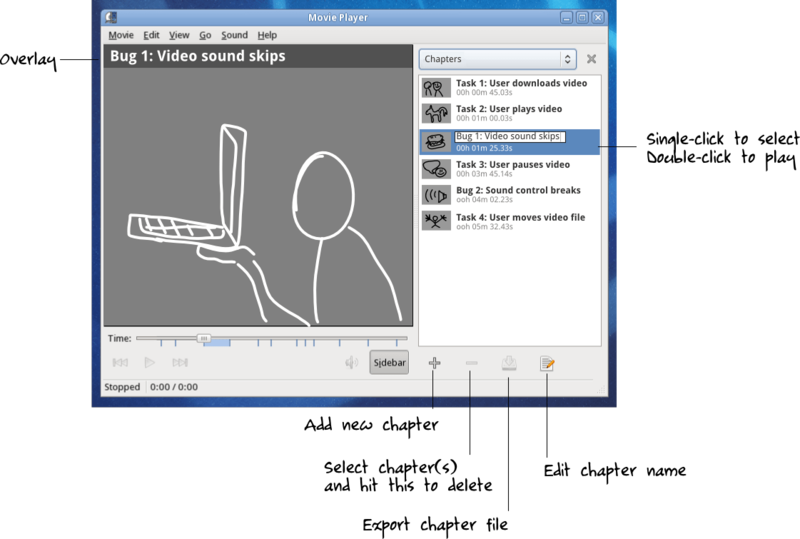 From memory the TED video player had pretty cool system for chapters etc. Could have a look at that for some ideas? This is great, even more, it’s amazing, I’ve been wondering about propose this to a GSOC! A few years ago I hate totem but now I think it’s easy and powerful (things that doesn’t match so often). Holy cow, chapters in Totem! That’d nice. I remember you posting about the ‘.’ feature in totem. It would a great add if we could bookmark a point and then play from bookmark to bookmark, somewhat similar to the chapters thing. Looks neat! Though I’d love it if you found an alternative to the double-click. A ‘play’ button in each list item, maybe? Is there a UX consensus on double-clicks? Double-clicking can be problematic for some motor impaired users, and us lazy users don’t like it either. Best to avoid it if you can. It’d be nice if there was some kind of visual link between the markers on the timeline and the chapters in the list. Figuring out which marker corresponds to which chapter now involves counting, if I understand the mockup correctly. http://liris.cnrs.fr/advene/ might be interesting for your use-case as well. It seems to go a few steps further then what you’re proposing for totem. I really like this feature. I can’t wait for see it! Keep the good work!